I've gotten this for my cats before. Not the greatest food, but still pretty good. My cats really enjoy it. A little pricey. My cats REFUSED to eat this - thank god it was only a sample size. My cats like other grain-free foods, but they didn't like this one. My cats will not eat this although I've bought it several times trying to get them to like it. I wonder why some cats like it and others do not. Grain free cat food- works well for my cat with grain allergies. 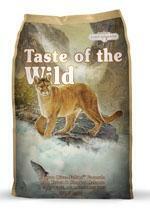 This product is affordable and priced well below other grain free cat foods. From what I have learned they do not advertise so they pass on the saving to the customer. My cats love this food. Their health and appearance has approved since starting the product two years ago. Since this food is high in protein with no grain fillers, 1/2 to 3/4 of a cup is enough to feed a 10 lb cat per day. I do not have a bad thing to say about this cat food. I absolutely love it.